Ex-employee joined by class action suit, claims the bracelets were made in Costa Rica is false. Pura Vida Bracelets was started by San Diegans Paul Goodman and Griffin Thall after taking a trip to Costa Rica in 2010. “A college graduation trip to Costa Rica turned into a life-changing business venture for two Southern California friends, Griffin Thall and Paul Goodman,” says their website. Once there they came across two street vendors were selling bracelets. They bought 400 of them and returned to San Diego. Shortly after the two formed Pura Vida. Goodman and Thall ramped up production. 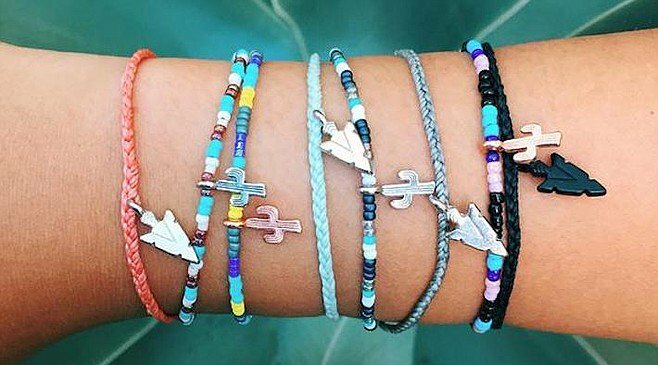 They allegedly employed 150 Costa Ricans to begin making the bracelets, generating approximately US$9 million in revenue according to the lawsuit. San Diego resident Imanda Marcus bought one of the bracelets at Pura Vida’s La Jolla storefront. She bought into the company’s mission statement, that they were made in Costa Rica and the money is returned to those artisans. She followed the company on Instagram. “[Claims the bracelets were made in Costa Rica], which has been made for years on Pura Vida’s extensive online and social media marketing, as well as the product packaging itself, to all its customers and many of its employees, is false,” reads the lawsuit.